Ever wanted to try a bargello but found it intimidating? This two day workshop will give you the skills and confidence to move forward with your creative quilting. The product for this class is a 28” x 42” table runner or wall hanging. The pattern by Cheryl Phillips includes a 15º wedge tool and her website offers several additional free patterns that use this tool. The pattern is available at Cedar House Quilting but you are not obligated to purchase here. ​This is offered as a two day workshop. Day 1: You will be sewing strata (strip sets.) You will learn to sew them in the correct order, keep them straight and pressed correctly. This requires some organization. You will be shown how to cut and organize the wedges using the included wedge tool. All the wedges need to be cut before the next class. This can be considered a beginner level workshop on cutting and assembling the strata. Skills developed here can be applicable to a variety of bargello style projects. Day 2: In this session we work through the more complex task of sewing the wedges into quarters and assembling the strata to produce the figure 8 table runner. 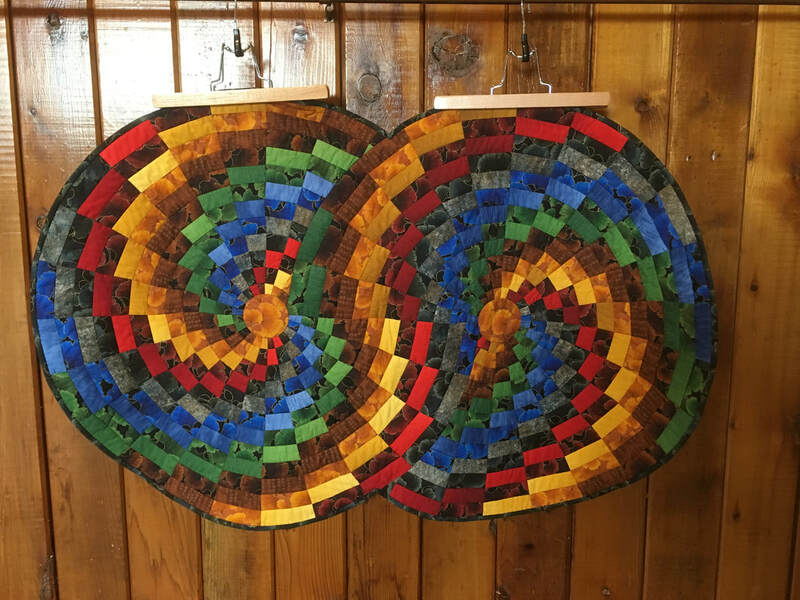 Pattern - Bargello Color Wheel by Cheryl Phillips (includes wedge tool). $18.99 + taxes at Cedar House Quilting. Fabric (PRECUT BEFORE CLASS! ): 12 different fabrics each cut into 12 strips measuring 14” x 1½”. <That’s a total of 144 strips.> It is important to cut as accurately as possible.